Description: This gorgeous tree is about 30 feet tall with large, glossy, pinnate leaves. For those who aren't plant nerds, pinnate means that the leaf is made up of smaller leaflets. Flowers protrude in a circular, umbrella-shaped cluster from the base of the leaf where it connects to the stem; these are filled with nectar. Once pollinated, large fruit (compared to most other native members of the same genus) about the size of black olives develop with a round reddish-pink cap. This cap is formed from the base of the calyx, the part of the flower that encases the petals. Distribution: In the garden? Not likely. 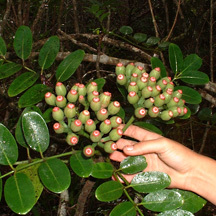 This plant is found only on Kauai in the wet forest. It can be easily admired from the road on the way to Kalalau lookout in Koke'e. You can distinguish 'Ohe Kiko'ola by the shape of its leaves. Also, it generally stands taller and is more column-like than the other trees and shrubs. Landscape Use and Care: Not much is known about this plant in landscapes. I have only seen it growing in the wild. Other native members of this genus, Tetraplasandra, have been used in gardens on a very limited basis and usually by professionals in the field. 'Ohe Kiko'ola are spectacular trees, but because of their rarity and difficulty propagating, don't expect to see them at a garden shop any time soon. There are no cultural uses for this species that I am aware of. Although this plant and other native members of this genus are called 'ohe, it is in no way related to another Hawaiian plant also called 'ohe: bamboo. Tasty Tid Bit: This plant is closely related to a noxious weed many of us are familiar with, the octopus tree. Called by names such as Schefflera, Brassaia, rubber tree and he'e, this invasive plant, commonly used as an ornamental, has taken over many parts of Hawaii's mesic forests. Their fruit, which form at the top of the plant and look like maroon octopus legs, are eaten by non-native birds that disperse their seeds everywhere. They can easily be seen taking over the forest along the H-3 freeway on the Haiku side of the tunnels.